You may have noticed that the We Are Cardiff website features some rather wonderful photography. We’ve decided to run a series of posts introducing you to our photographers, who volunteer their time to keep this website looking as amazing as possible. For our first post, please meet the lovely Ffion Matthews! There are so many reasons Cardiff is great, but the one thing everyone always tells me, and I completely agree, is that it is such a friendly city! Oh gosh! There’s so many to choose from Mezza Luna on City Road to Bayside Brasserie. But one food that I just can’t resist is Mexican, and thanks to Las Iguanas (Centre and Bay) I can feed my addiction at any point! But Cardiff has so many great places to eat, I hope to go to Patagonia (Canton) soon as I hear such fantastic things about it. I don’t often go shopping, but when I do, I head straight to our historic arcades, losing myself in all it offers, and can’t resist visiting and playing dress-up in A Vintage Affair. Upstairs there is a whole playground of hats, shoes and other amazing vintage clothes, I could spend all day there! I have a couple of favourite venues for different reasons. Gwdihw is great for an intimate (and sometimes crazy) gig, which also offers board games, comedy nights and great beer. Ten Feet Tall offer a mean cocktail. And Undertone right next to it for a long night of dancing – great things come in small packages! I think one of my fondest memories is before I moved to Cardiff. For my 16th birthday, my brother bought us tickets to see Incubus at the then called CIA, he lived in Splott at the time so I stayed for the weekend and loved ever minute of it! At the moment I am swamped in research for a piece I’m writing, all regarding the phases of postmodernism, feminism and female artists. I think you’d all rather me not bombard you with my readings 😉 Go Girl Power! I’m usually a bit of a film buff, but I haven’t watched many recently (now with all my feminism books taking over), and certainly not many good ones. I have Sin Nombre lined up though, which I have high hoped for! After going to a gig at 10 Feet Tall to see Golden Fable, a friend of mine who performs as Elephant and Soldier was supporting them. Having never seen him perform before, I was absolutely blown away by his voice. So if you are into acousticy, gruffly voice that you can lose yourself in, check him out. What’s your one Cardiff secret you’ll let us into? I’m still searching for my secret spot. Having lived her for about three and a half years now, I’m actually still finding my feet to an extent. Every new place I go feels like a hidden gem, I always ask myself “How did I not know of this place before?” and then often it becomes a favourite; like Gwdihw, Undertone, the arcades, the beautiful surrounding villages and towns. I adore the fact that I can go from the busy city centre, to a fantastic quiet country walk around Garth Woods, stopping off at Gwaelod Y Garth Inn for a cheeky pit stop. So I think there is more to Cardiff than I know, I’m still learning, and loving this place more and more as I go along. Any projects you’re working on at the mo you want to big up…? At the moment most of my time and focus is being put into my degree, which leaves little time to manage my own work. But I will be displaying my latest project at an Exhibition at the Riverfront, Newport from the 23-25th of May. What camera do you use? Any favoured lenses for portrait photoshoots like the We Are Cardiff shoots? 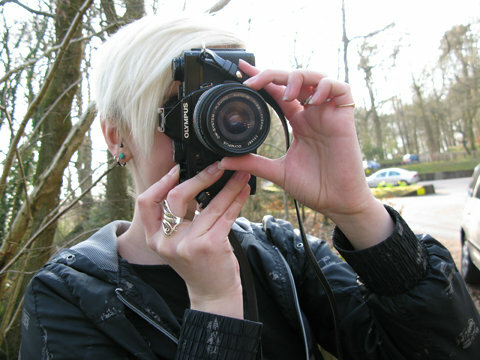 At the moment I have a Canon 450D which I mainly use, but looking to upgrade it soon. I also have a beautiful Mamiya RB67, and Nikon FG-20 that I don’t use as often for the simple reason of that in this digital world it takes precious time to develop/print/scan nowadays. Although I do still love using them, but more for personal projects than anything else. I have enjoyed every single shoot I have done for We Are Cardiff; it is always so interesting to meet such a variety of different people. But I think my most memorable has to be photographing the lovely burlesque dancer, Cherrie Pips at 10 Feet Tall. Never had I shot a burlesque dancer before, and she was such a pleasure to be around, and made even more interesting with my lighting equipment failing and having to think on my feet. Luckily for me she was fantastic about the whole thing and I don’t think we stopped laughing the whole way through!